Jerusalem—After a tumultuous summer, the clashes outside al-Aqsa mosque on 8 October that injured more than 20 people seemed almost alarmingly mundane. 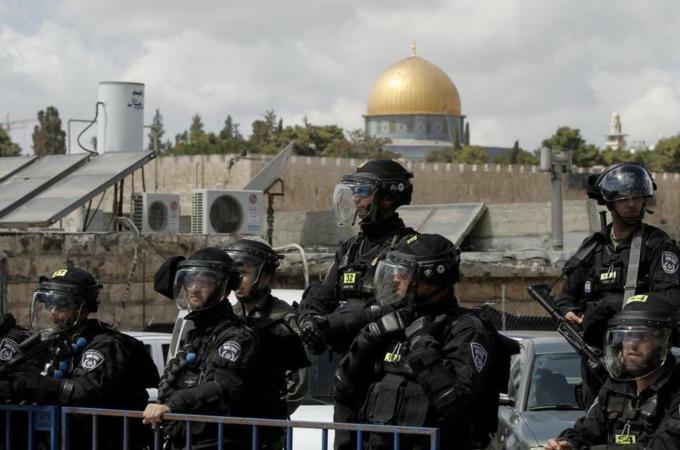 On Monday, 13 October, fresh clashes erupted when hundreds of Israeli police forces raided the al-Aqsa mosque compound and clashed with Palestinian worshippers. Residents of East Jerusalem have fought almost nightly with Israeli security forces. The light rail running through the city has been attacked nearly 100 times since July, according to CityPass, the company that administers it. Hundreds of Palestinians have been arrested, many on flimsy evidence. Israeli Prime Minister Benjamin Netanyahu met with security officials on October 7, and urged vigorous action to curb violence in the city. The unrest has been fuelled by a number of factors, including the brutal murder of Mohammed Abu Khdair and this summer`s war in Gaza. Adding to the tension, though, is a series of provocative moves, mostly by private organisations, aimed at increasing the number of Jewish settlers in East Jerusalem. The steps are piecemeal - building a new religious seminary, buying a few dozen homes from Palestinians. They will not significantly alter the city`s demographic balance: In the last two decades, the number of settlers has increased from 1,400 to around 2,600. But they have brought an influx of ideological settlers to the city, making it far more difficult to divide Jerusalem in a two-state solution, which envisions a Palestinian capital in the east. It contains the seeds of the Hebronisation of Jerusalem, said Daniel Seidemann, an Israeli lawyer and Jerusalem expert, referring to the West Bank city where a handful of staunchly ideological settlers live under heavy military guard. [It] morphs the conflict from a political one, which can be solved, to a religious conflict that cannot. The latest flashpoint is in Silwan, a Palestinian neighbourhood perched on a steep hill south of the Old City. A settler group called the City of David Foundation, commonly known by its Hebrew acronym Elad, purchased seven buildings there containing 22 housing units. Their new Jewish inhabitants started moving in last week. The homes have been outfitted with metal gates and security cameras; armed guards linger outside, and accompany the settlers whenever they leave. In past cases, Palestinians have been evicted from their homes. This time though, Elad bought the homes legally, working through middlemen, according to residents of the neighbourhood. A broker came to me two months ago, a Palestinian guy, and he offered to pay me full price for my house, said Mahmoud Abdel Qader, who lives near the base of the hill. One million shekels! He said we could go to the municipality immediately and do the paperwork. Several other Silwan residents had similar experiences, as did a man from Jabal al-Mukaber, a neighbourhood further south. In each case, they said, the brokers were Palestinians claiming to be affiliated with the Islamic Movement, a religious and social organisation. The group did not respond to a request for comment. Economy Minister Naftali Bennett, the rising star of Israel`s right wing, bluntly outlined the strategy in a video recorded last week. About 25 years ago, a wonderful organisation decided to return the City of David to Jewish hands, Bennett said, referring to Elad. Slowly, and with patience, it started purchasing homes at full price, and populated them with Jewish families. Bennett went on to explain that last week`s purchases doubled the Jewish population in the area. [Now] there is a Jewish majority, he claimed. In fact, there is no such thing in Silwan, even in the small area designated as the City of David, where Jews now make up perhaps 20 percent of the population. Activists, however, say the latest wave of settlement is a beachhead, and an obstacle to a future split. The objective, yes, it`s to strengthen the Jewish presence in all areas of East Jerusalem, said Aryeh King, a member of the Jerusalem city council and right-wing activist who founded an organisation devoted to settling Jews in East Jerusalem. This way we can stop, or at least delay, Bibi`s idea of dividing the city, and wait for the right political leadership that won`t think about this. King contrasted the purchases with last month`s decision by the municipal planning committee to build 2,610 new units in the settlement of Givat Hamatos. Construction there would choke off the Palestinian neighbourhood of Beit Safafa, with serious implications for a two-state solution. But the plan has been in the works for years, and King doubts it will ever move forward. Netanyahu just wanted to increase his support with the right-wing, he said dismissively. It`s a game … nothing will happen. This view of Netanyahu, as a crypto-leftist secretly plotting to divide Jerusalem, is a common one inside the settler movement. So groups like Elad, and its competitor Ateret Cohanim, are moving aggressively into Palestinian neighbourhoods in the east. The latter secretly bought a 1,000sqr m space in May, in a building that houses the area`s post office. It overlooks the Damascus Gate, one of the most central entry points to the Old City and a historical symbol of Palestinian East Jerusalem. Ateret Cohanim renovated the space into a large yeshiva, a Jewish seminary, in the middle of East Jerusalem - slated to be part of a future Palestinian state. In February, the city`s planning committee approved the construction of another yeshiva, this time in Sheikh Jarrah, a predominately Palestinian neighbourhood in the eastern part of the city. According to Seidemann, the seminary is being built with the backing of the Israeli government. It`s part of the pattern of transforming the area around the Old City into some sort of pseudo-biblical theme park, and putting exclusionary religion on the ascendance in the area, he said. Adding to the concerns, are heightened calls by Jewish groups to be allowed to pray at the site that houses al-Aqsa mosque, which is revered by Muslims as the Noble Sanctuary and by Jews as the Temple Mount. Israel`s Army Radio reported this week that the tourism ministry might open a second gate to the compound for non-Muslims, who currently are allowed access only via the Mughrabi Gate. Diplomats from the European Union warned earlier this year that any change in the status quo could potentially spark extreme reactions locally as well as across the Arab and Muslim world, according to a leaked cable. At the base of the compound, meanwhile, work has begun on a state-funded project to rebuild the Tiferet Yisrael (Splendour of Israel) synagogue. The Arab Legion destroyed it in 1948 because the Haganah, the pre-state Jewish militia, was using it as a hideout; earlier this year the Knesset allocated 50 million shekels ($13.4m) for reconstruction. The new development plan has drawn Palestinian ire, though, due to its proximity to al-Aqsa, the third holiest site in Islam. Israel is building in the vicinity of al-Aqsa mosque and in the Old City to `Judaise` Jerusalem, said Sheikh Azzam al-Khatib, head of the Waqf, which administers Jerusalem`s Islamic sites. It seems the more extreme Jewish elements don`t want to coexist with either the Christians or the Muslims of this place, Khatib said. And this is apparent by their actions: Many synagogues and religious schools are popping up in sensitive spots in the Old City. But some do not see the link between renovating a religious site and efforts to change the status quo. I don`t see the restoration of a historical synagogue in the Old City as being particularly problematic, Seidemann said. Instead he described the controversy as another symptom of the growing hostility here - the sense of an existential battle for the character of East Jerusalem. What I think we`re seeing here is the transformation of this conflict into a zero-sum religious conflict: Anything that`s good for the Jews, is by definition bad for the Muslims and vice versa, he said. Photo: Residents of East Jerusalem have fought almost nightly with Israeli security forces. Source: AFP.